Leeta, a succubus, is looking for a True Love match. Which is highly unusual, as most succubi are aromantic. But Aphrodite Agency — her only hope — turns her away because the receptionist can’t believe she’s not just looking for an easy meal. Carla agrees to take Leeta’s case on freelance. She figures it’s a win-win: Carla gets to put a succubus’s True Love match on her résumé, and Leeta gets to find her True Love! Except as Carla tries to find a match for Leeta, she finds herself maybe... relieved when the matches don’t end well. And Leeta seems to be getting pickier and pickier. Things will never work out until Carla learns enough about chemistry to figure out who’s truly best for Leeta, and until Leeta can admit what — or who — she truly wants. This is a really quick and cute read. It is lighthearted, amusing, and witty. Carla is an ambitious cupid, who is better at the shooting of arrows than the reading of chemistry. We get to see this in action, as she agrees to work freelance to help an unusually romantic succubus, Leeta, find her soulmate. Leeta, and the reader, soon get the chemistry vibe, but the naive Carla just thinks she is failing again. As things are resolved, one cannot help but smile and sigh with relief for them both! I read Mr. Wayne's Counterbalance back in September, and enjoyed its originality – this is very different and whilst much more frivolous, also as enjoyable. 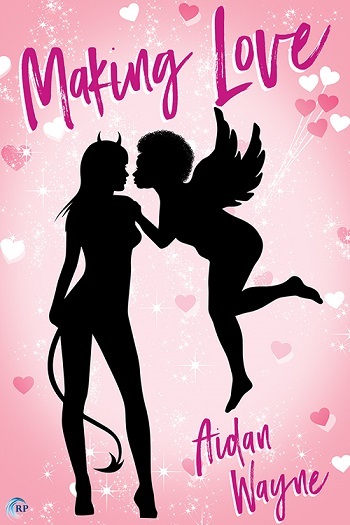 Reviewers on the Wicked Reads Review Team were provided a free copy of Making Love by Aidan Wayne to read and review.